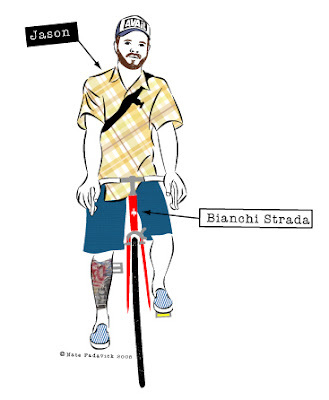 This image is from an online retrospective that grows a little bit every day called "Portlanders and Their Bicycles". It's the work of Columbus, Ohio-based artist Nate Padavick, who was inspired by his summer in Portland. How inspiring is Portland, especially for us born-and-bred Midwesterners? Without a doubt, it's one of the best cities in the country, especially if you like to ride a bike. If you haven't been there, you're probably all like "Blah blah blah. I'm tired of hearing about great Portland is. How great can it be?" Trust me: That great. I've been to Mt. Hood, I've bicycled the Bridge Pedal, and I've downed a lot of IPAs there. So again: That great. But don't take my word for it. Take NPR's. Yesterday's "All Things Considered" had this story from Portland on bicycling to work, which 6% of Portlanders do. (It's only 4 minutes long and worth a quick listen.) The city is committed to increasing travel by bike, with bike boulevards and bike boxes to improve safety for both car-drivers and bicyclists -- and they say they are just beginning to make the city bike-friendly. Hey - thanks for posting this!! Portland is great, but I have to say that Peninsula has it beat for being a starting point for tons of great country riding!